So for those who don't know, in the last five or six years I've started attending more and more dance recitals here in Chicago, as my hearing continues to get worse and it becomes more and more difficult to attend my previous Saturday night events like movies, plays and rock shows. I'm not a dancer myself, and know almost nothing about the activity's history or theory; but I first became fascinated with the connection between movement and creativity in the 1990s while dating a woman who worked as a “kinetic art therapist,” i.e. someone who helps others work through psychological problems via movement and dance, and since then I've discovered a real joy in attending creative movement pieces here in the city. And better yet, much like the “storefront theatre” community for actors in Chicago, the city also has a network of indie spaces for startup dance companies and independent choreographers, meaning that it's entirely possible to go out every weekend and see an amazing dance recital for only $10 or 20, versus the often $100 tickets for downtown shows at the Joffrey Ballet and the Harris Theatre. A few weeks ago I attended the spring recital of Oak Park's MOMENTA, which is basically a professional company that was established by the prestigious Academy of Movement and Music; the academy itself teaches students from grade school up to the age of eighteen, but MOMENTA is specifically a professional showcase for their older students and the academy's faculty, many of whom have longstanding ties with the Martha Graham Company, Julliard, the Kennedy Center, and nearly all of Chicago's local universities. The recital in general was great, but what really floored me were two pieces that night that were specifically written for people in wheelchairs, something I had never even thought about when it came to dance until witnessing it for myself. The dancers involved were adept movement artists, and in one case (with dance veteran Kris Lenzo) buff as hell too, using his athletics-optimized wheelchair as essentially an extension of his torso, able to twist and lean and spin and fall as easily as someone with physical legs. Like most people, I've been raised to look at the US population as basically existing in two general groups: there are the “normal” people, who constitute the vast majority of our country, and then the “not normal” minority (currently known by the politically correct term “disabled”) who have something wrong with their bodies, whether it's that they can't see, that they can't hear, that they're missing arms or legs, etc. Looking at the world this way doesn't necessarily mean that you're thinking any less of the minority in the “not normal” group; but certainly it trains you to think that our goal as an enlightened society should be to provide special, attention-calling options for letting this “not normal” minority exist within the world of the “normals” in a better and more complete way. What I'm coming to realize this year is that it's much more accurate to instead look at the world in this way — that there's a theoretical model of a “perfect” human being that exists on paper, but that not a single one of us actually lives up to that model of perfection, meaning that every single human being on Earth deals daily with some kind of imperfection to their system (and most of the time several). Some of these imperfections are very easy to see when you glance at a stranger — like people who can't hear, people who can't see, people who are missing arms or legs — but the vast majority of bodily imperfections are invisible to the naked eye, and most often incredibly easy to hide from strangers. Some of us have high blood pressure. Some have low blood sugar. Some are dyslexic. Some are autistic. Some of us have uncontrollable anger. Some of us have a predisposition towards addiction. Some have brittle bones. Some people have epilepsy. Some are color-blind. Some people have attention deficit disorder. Some have one leg that's shorter than the other. Some people are farsighted. Some are nearsighted. Some have acid reflux syndrome. And on and on and on and on and on. So our goal as a society, then, shouldn't be to provide outlandish alternatives, handed on a silver platter like a benevolent gift from the “normals,” for “allowing” a small minority of people to be “like the rest of us;” the goal should be a constant series of small, manageable changes so that all of us imperfect humans can live in an environment that provides as equal an opportunity as possible for us as individuals to succeed or fail based on our own actions. Think, for example, of how in recent years, fast-food restaurants have started offering more and more “heart-healthy” choices for those who have imperfections with their hearts and blood. It didn't take a lot of effort for these places to offer these kinds of choices (it mainly just consisted of tweaking a few menu items so that they no longer contain salt, sugar and carbs); it didn't take a lot of effort to convince these places to do it in the first place (just a gentle but insistent demand from their customers); no one's forcing you to buy the heart-healthy versions if you don't want (by all means, libertarians, keep shoveling those Big Macs into your pre-diabetic system if that's what you choose to do); yet the addition of this option has meant a world of difference for those who do want to keep careful track of their salt, sugar and carbs, who before recent years simply couldn't eat at any fast-food places at all, making simple things like highway road trips or a day of tourist sightseeing an exercise in frustration. In any case, Kenney nicely wrote back to me and let me know about an event coming up that she thought I'd find interesting — the 2nd annual Chicago Inclusive Dance Festival, sponsored by the Mayor's Office for People With Disabilities, and held down at that organization's headquarters on the Cook County Health campus (more familiarly known as “Cook County Hospital” and the buildings that surround it). And she was right — I did find it interesting! 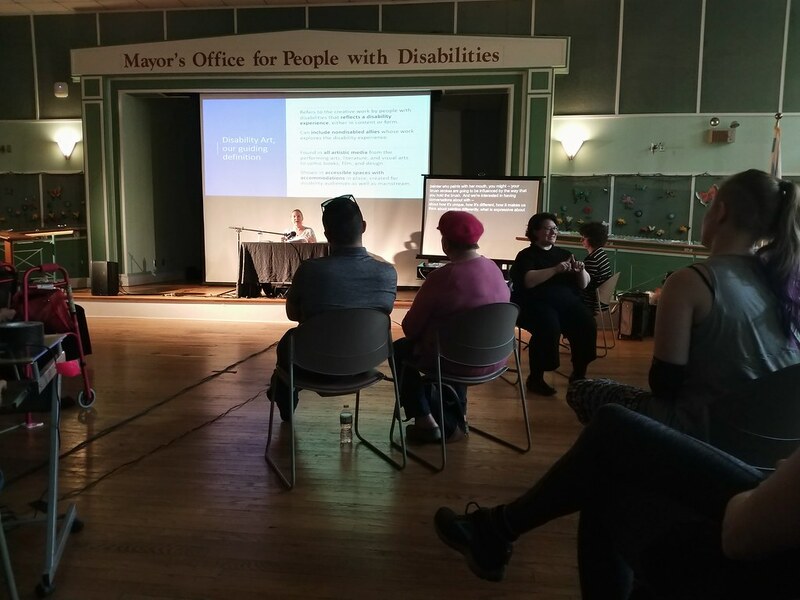 It wasn't really a “festival” per se, but more a series of workshops, film screenings, and panel discussions, devoted specifically to the challenge of incorporating disabilities into the field of dance, but more generally dedicated to the subject of disabilities within the arts overall. As longtime readers know, I myself have been mostly involved with the literary community over the years, and all of this is starting to really make my gears turn as far as how I might be able to help provide more access for the Deaf at Chicago's various live literary and theatrical productions. After all, Chicago has one of the largest live literary-performance communities in the world, is the city that birthed Steppenwolf and a hundred other indie theatre companies, and is also the city where the poetry slam was invented; if there's one place that could benefit the most from incorporating ASL interpretation and live captioning into such events, that would be here, which has me thinking a lot these days about the subject and what I could possibly do about it. And then of course there was one other big reason I wanted to attend the Inclusive Dance Festival, which is that this would be my first opportunity since starting ASL classes to be around a professional sign-language interpreter, as well as native Deaf people relying on this interpreter for their comprehension. Regular readers will remember me talking about this subject in my last blog entry, about how I've recently started the process of trying to throw myself into as many real-time opportunities as possible to witness and maybe participate in ASL conversations, now that I've been doing sign-language classes by myself at home for a month, and am just comfortable enough now with my skills to know that I can at least sign things like, “I'm a beginner,” “I understand very little,” “I'm here mostly to just watch,” “Oh Lord I'm so horrible at sign language” (not a joke, I actually know how to sign this), etc. I don't necessarily feel the obligation to be particularly good at signing to at least attempt to communicate with others, but certainly I feel the obligation to at least be able to express that I'm not particularly good at it, and to thank others for being patient with my slowness and rookie mistakes. Watching a fluent ASL interpreter sign in real time was both an enlightening and frustrating thing; frustrating because, as you might expect, I couldn't follow the vast majority of what she was saying, but surprisingly enlightening because I could actually catch about one out of every ten words. I have to admit, that kind of amazed me, given that I've only been studying for a month now, and don't really have any experience yet at trying to follow a native speaker at full speed, and it gave me a lot of confidence in the idea that I'm actually starting to absorb some of this stuff. Then during a break, I decided to introduce myself to her, so that I could say that I had officially had my second-ever ASL conversation, after the one on Tuesday with my teacher at Columbia College. “Are you hearing?” I asked, which I immediately realized was a stupid question, in that she had been interpreting the hearing speakers of the conference for the last two hours. Well, what do you know — officially one more step inwards towards my gentle introduction into Chicago's Deaf community! This is exactly the kind of group I'm hoping to get involved with right now, one that's made up of ASL teachers and students who will be tolerant of a slow, mistake-riddled beginner like me. Eventually my goal is to more and more immersed in just the general community of Deaf people in Chicago, but as I mentioned last time, I'm wary of doing this too soon — just like anybody who's a native speaker of a language, I don't want to be a pest to such people while I remain a beginner who can barely speak it, and I also don't want to come across as the “rude hearie tourist” who's trying to barge his way in and stomp around within a community that by necessity over the years has been quite insular and protective of its own. With any luck, the next blog entry I'll have for you will be a report from the club, and at the very least I'll get an update posted in a few weeks about how my evening workshops are going. Talk with you again then!